We all struggle as professionals to stay on top of our game. Here is a book with hundreds of practical ways to take control of moving your career in the direction you want to go - and of helping your people do the same. 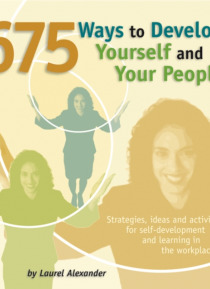 675 Ways to Develop Yourself and Your People reflects the real needs of real people in today's workplace. You'll gain exercises, activities and strategies that will help you develo… p your ability to build positive work relationships, change an aspect of your interpersonal behavior, come across as powerful in meetings, listen, make decisions, survive a downsizing and much more. The engaging and hands-on resource provides a set of 50 individual learning opportunities and over 600 ideas, techniques and activities for making the most of the learning opportunities. Each module begins with an overview of the subject and moves on to exercises in easy-to-use categories.You can pick up this book and start wherever you like. You'll be amazed at how many opportunities you face each day to learn with and from your co-workers, facilitate the development process in others and travel purposefully through your life.